Things are changing again on the Sandy River. The Sandy River Watershed Council received nearly $1 million from the National Coastal Resilience Fund last month to implant a two-year, $2 million project in the Sandy Basin. The goal of the project is to reduce flood risk and improve fish habitat, which the Council said in turn will benefit people living in the watershed. "The beauty of this project is that the steps to restoring habitat for wild salmon are also the best path to reduce flood risk for nearby homes, roads and other essential community infrastructure," said Steve Wise, executive director of the Sandy River Watershed Council. "This is work that will make the community more resilient in years to come in the face of climate change." In 1964, The Sandy River experienced its largest flood on record, which destroyed more than 150 homes and caused severe channel migration. As a result, the U.S. Army Corps of Engineers built levees to contain the river, but intense floods and channel migration occurred again in 1996 and 2011, regardless. "Current science shows levees can't hold back rivers for very long, and that their unintended consequence was to, 1) cut off fish from key floodplain habitat, and 2) disperse the river's energy in major floods," the Council said in a statement. "River engineers determined that the aging levees are starting to fail, and that removing them to allow the river to reconnect with its floodplain during high-water events would be the best way to reduce flood risk while also restoring habitat for threatened wild salmon and steelhead." "It was well-intended work, but we know more now and have a better understanding of how a river works," Wise added. A concern with any project that changes the structure of a habitat is the effects it may have on surrounding areas. "We don't think there are other animals that will be negatively affected by the project," Wise noted. "Serving the habitat for fish serves the animals all around the river." The Sandy River is home to spring and fall chinook, coho and steelhead salmon, and the project aims to improve the environment for these important regional fish. However, Wise said, "all of the species (living around the river) benefit." Over the course of two years, the council plans to restore floodplain "across 418 acres along one mile of floodplain at the confluence of the Sandy and Salmon rivers," according to a statement. 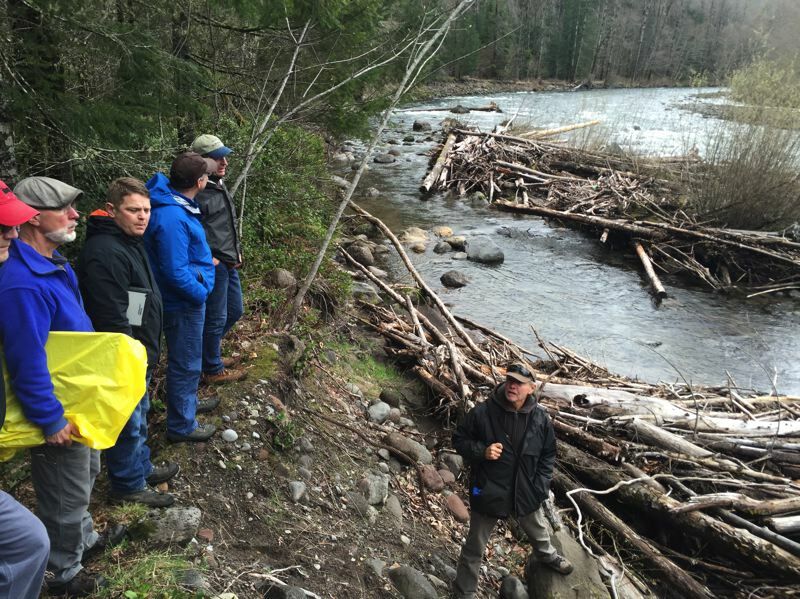 The project will entail removing parts of levees, reconnecting river flow to currently isolated channels behind the levees and adding large log jams that disperse river energy while serving as hiding and feeding areas for migrating young salmon. "These features reconnect in-stream habitat and increase the river's ability to absorb energy from intense storms," the Council said. "Restoration will restore habitat for threatened wild salmon and steelhead, while reducing potential streambank erosion, flood risk in all but the most extreme events." This, Wise noted, will be one of a series of projects to be implemented in the coming years, and this project in particular ranked highly in priority. "We see this project being replicated in other areas of the river and other rivers in the future," Wise said. "Ultimately, the river's going to do what it's going to do, but doing things deliberately now ahead of time is better than waiting to see what the river does. Science shows that trying to confine the river between its historic banks is not (effective). Working with the river is more productive than working against it." At this point, the Council is in the process of applying for permits to begin work on the Sandy. The hope is to start groundwork for construction by next summer and implement the project between July and September 2019. Wise noted that it may take more than one summer to complete the project because the Council is being conscious of working around migration cycles. A walkthrough will be scheduled that is open to the public.